Rose Garrard’s ‘Casting Room I’ will be on display in the Research Space on the 1st floor of Kettle’s Yard. 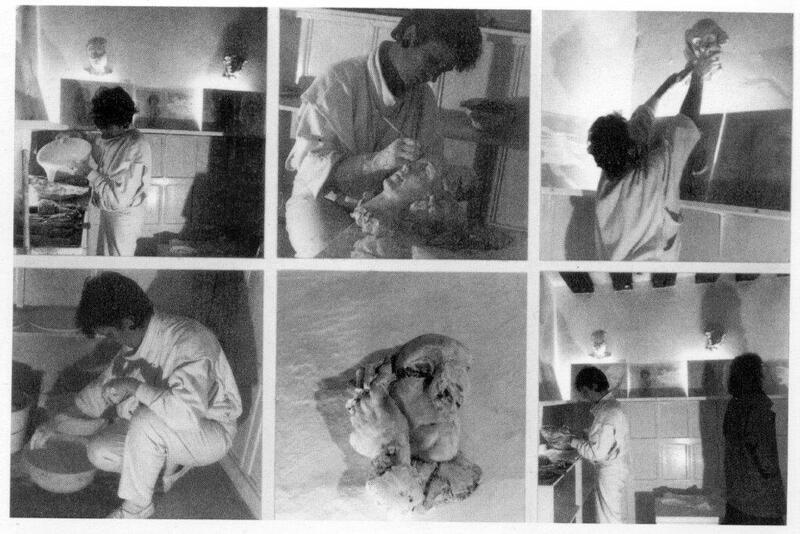 Made in 1986 during a performance in which Rose Garrard transformed a corner shop into a plaster casting studio, these sculptures juxtapose images of historic women artists and page three girls from the Sun newspaper. They are both a document of the gender politics of the 1980s, and a protest at the exclusion of women artists from the history of art and the objectification of women in the British press. This is the first time the works have been exhibited since 1994. Find out more about the projects in our free lunchtime talk on Wednesday, 6 February 2019 at 1.30pm with curator Dr Amy Tobin. This event is free, no booking required. Rose Garrard trained as a sculptor at Stourbirdge, Birmingham and Chelsea Schools of Art and was awarded a British Council Scholarship to the Ecole des Beaux Arts where she won the Prix d’Honneur Gold Medal for Sculpture in 1971. Her work extended into installation, multimedia, performance, video and audio pieces. For 30 years she received many further awards, curated group exhibitions and exhibited in major galleries, nationally and internationally. In 1988 Rose was seriously injured in a motorbike accident and had to give up lecturing, but to aid her recovery she undertook a series of four artists residencies as durational live-works or ‘conversational pieces’ in Britain and Canada, each lasting for one month. The Cornerhouse Gallery in Manchester mounted a major retrospective of her work in 1994, a year after which Rose moved her studio from London back to the Malvern Hills. Rose Garrard’s ‘Models Triptych: Madonna Cascade’, 1982 is part of the New Hall Art Collection at Murray Edwards College, University of Cambridge. Image: Rose Garrard performing Casting Room I, Canterbury Arts Festival, 1986. Copyright and permission granted from the artist.